If your going to be playing slots a lot over the holidays you really should play in a tournament so you can pick up some extra cash. Tournaments are a great way to win some extra prize money -- all you risk is a small entry fee but you can win thousands. Liberty Slots is well known for its daily slots tournaments. 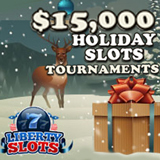 This month they're offering you chances to win a total of $15,000 in cash during its Holiday Slots Tournaments. Daily tournaments continue until January 4th. Each week the top 15 players win cash prizes up to $2500. During Christmas week all prizes will be doubled so the first place player will win $5000. A total of $15,000 will be awarded to slots tournament winners this month. Each tournament lasts one week, from Monday to Sunday but you can join at anytime. The series kicked off with a week on the popular Dragon Master slot game. Last week Hot Roller was the designated holiday tournament game. Beginning today and continuing until Sunday the featured game is Jurassic Slots. Next week the tournament will be played on The Reel Deal and Liberty Slots will ring in the New Year with the piratical X Marks the Spot as the tournament game during the last week of the month. Check your rank on the leaderboard in the Tournaments lobby any time.